Elizabeth Swinburne began her studies working with ceramics but a short introduction to glass blowing quickly enticed her away. She loved the seeming immediacy and spontaneity that the material demanded. However, quickly learnt that to do anything beyond the wobbly bubble or puddle on the floor required a serious technical undertaking. It has always been important to her to have a 'hands on' approach to creating. Her educational background and the years of teaching others has given her a broad range of technical skill and understanding to draw on. This means that her work is not limited to one technical approach, over the years she has used glassblowing, hot casting, kiln casting - whatever was appropriate to communicate her idea in the most effective way. Her work exploits the many characteristics of the material - its fluidity, fragility and transparency. Swinburne lives and works in Amsterdam, where she has a large electric oven and a range of glass finishing equipment. She rents specific equipment as her ideas and new projects demand. 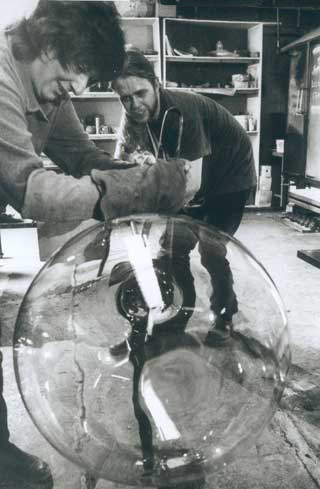 For glass blowing she often rents furnace time at Van Tetterode, Amsterdam or when bigger forms are required goes to Hartzkristal in Germany where she works with a team of craftsmen.